Used by publishers and educators alike, uCertify is a comprehensive assessment creation and delivery platform. The Credly integration instantly awards digital credentials when online assessments are successfully completed. From high stakes exams, professional licensure and credentialing, to tests and quizzes, achievement is automatically recognized with the Open Credit engine built right in. uCertify integrates Open Credit to make the issuing of digital credentials automatic and seamless with the test-taking experience. Successful exam takers need not wait for paper certificates. Verified, secure digital credentials are awarded as soon as a test is passed. 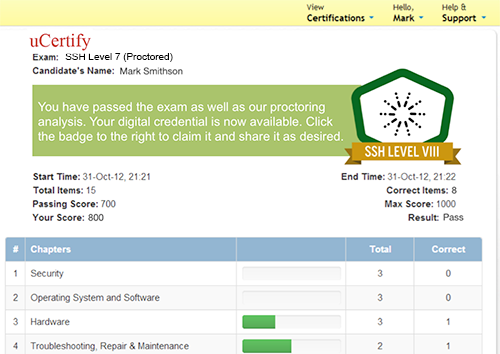 If a test requires review by an online proctoring service, digital badges are held in a pending state until the proctoring results are validated. Learn more about uCertify now.